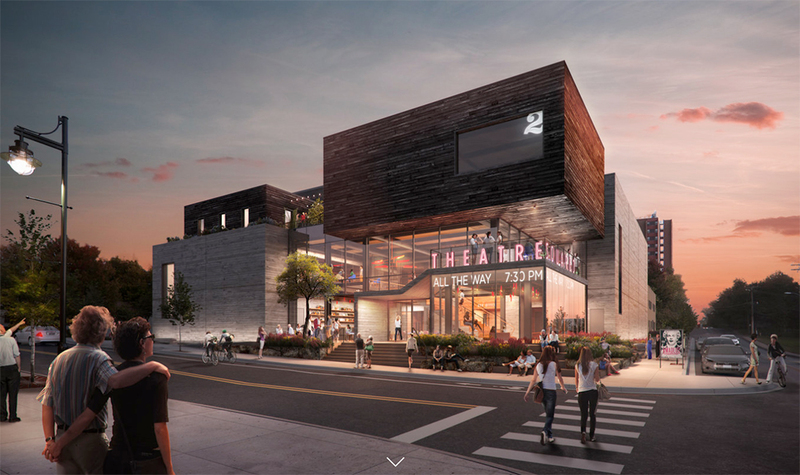 Airfloor™ Selected for TheatreSquared New Performance Space - Airfloor™ Inc.
TheatreSquared’s locally produced and nationally acclaimed productions reach 45,000 patrons each year. 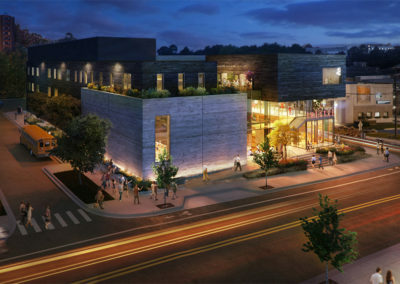 The company is Northwest Arkansas’s only year-round professional theatre, offering a unique audience experience in an intimate space at Walton Arts Center’s Nadine Baum Studios. 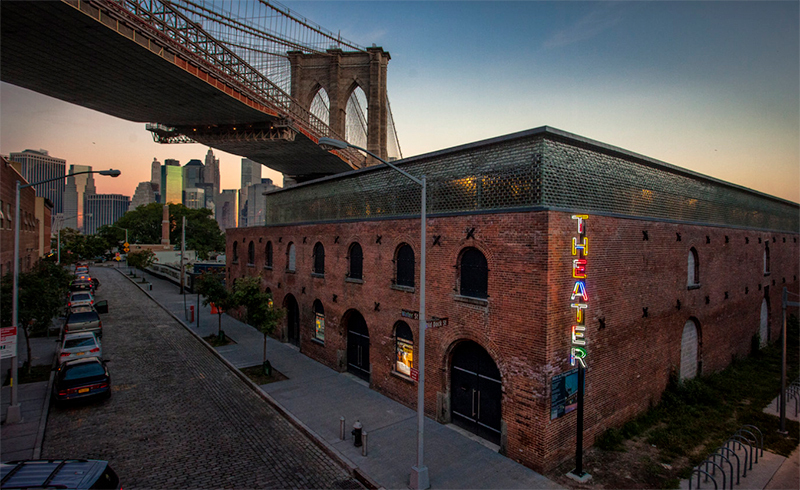 In 2011, TheatreSquared was recognized by the American Theatre Wing, founder of the Tony Awards, as one of the nation’s ten most promising emerging theatres. 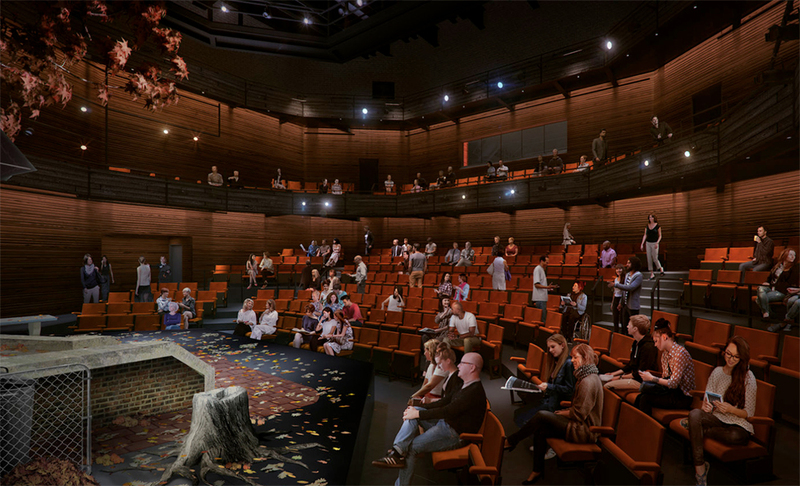 A professional company, TheatreSquared employs trained artists from across the country to create its 230 annual performances and is contracted with Actors’ Equity Association. 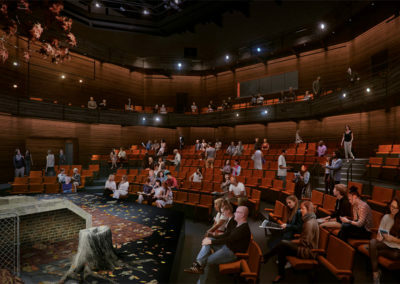 The theatre is also Arkansas’s home for professional playwrights, developing scripts through the Arkansas New Play Festival in Fayetteville and Bentonville and producing new works and world premieres each year. 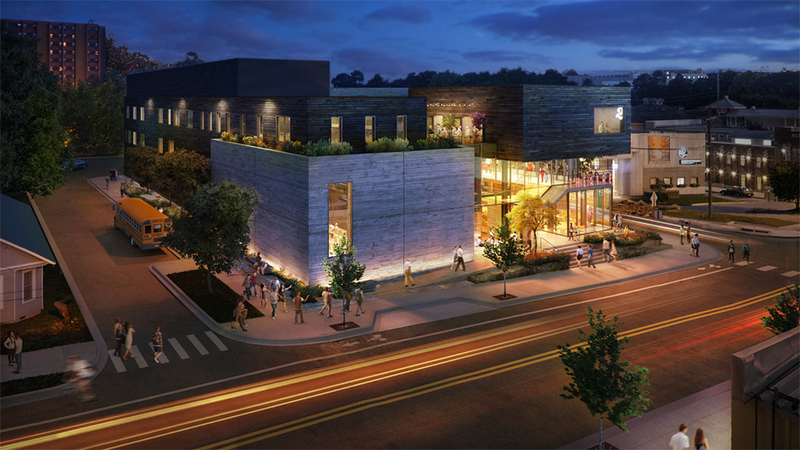 Corner of West Ave. and Spring St. in downtown Fayetteville — directly across from the theatre’s current venue in a converted warehouse at Walton Arts Center’s Nadine Baum Studios. 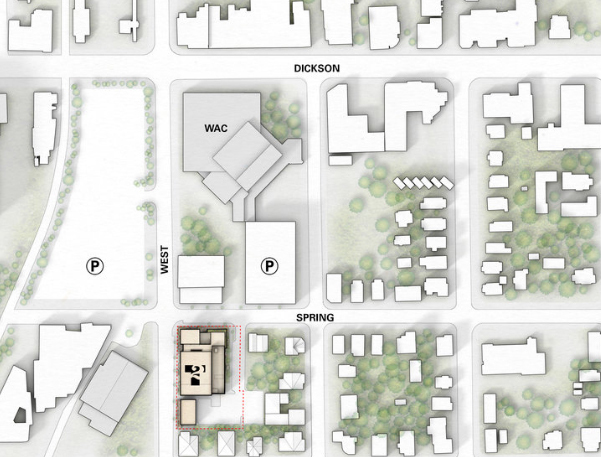 The process of creating a design for a new home actually began at the building’s core. Through dozens of artist and audience conversations, Charcoalblue worked to identify the key qualities that make TheatreSquared’s performances, in the words of one 10 year-old audience member, “exhilarating.” The new designs would amplify the virtues of T2’s current space, while adding perfect acoustics, unmatched sightlines, and the modern production tools of a state-of-the-art theatre. 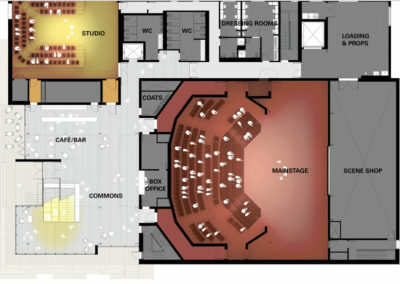 In TheatreSquared’s intimate new mainstage, the front row has moved even closer to the stage, while the back seating row is just one row deeper than in T2’s current space. 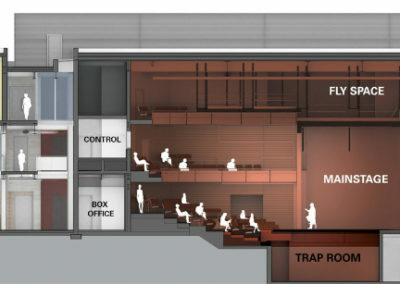 Audience members enter at a shared level with the performers. Two rows wrap around the top to create a new circle level with some of the best views in the house. The custom seats are self-rising, creating ample room for patrons to circulate. 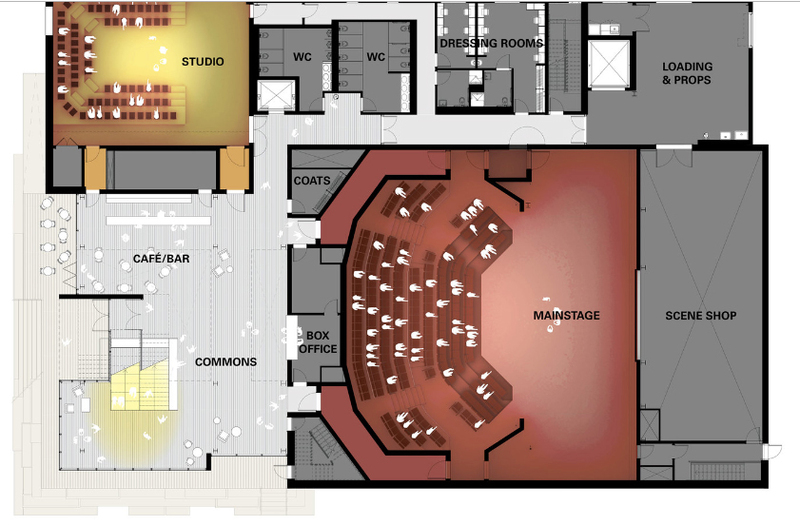 A third tier of seating can be activated for additional capacity as needed. And the walls of the audience seating section are clad in warm-hued, repurposed wood. 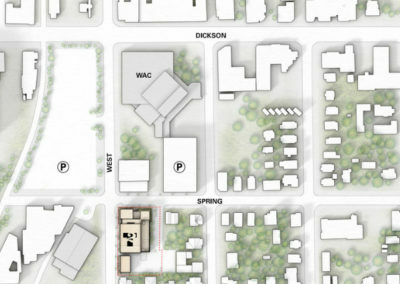 New York-based Marvel Architects was selected from over 70 international applicants to design the theatre building. 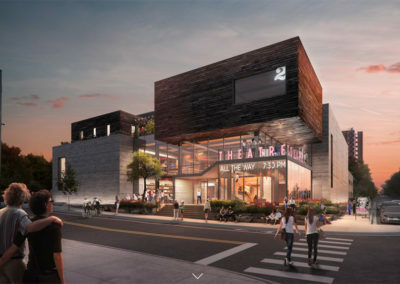 Marvel’s portfolio includes a new Brooklyn Public Library, the national competition-winning entry for the new Constitution Gardens on the National Mall, a master plan for Playwrights Horizons, and, in collaboration with Charcoalblue, the beautiful new home for the storied New York theatre company, St. Ann’s Warehouse (right).